The City of Lakeland Parks & Recreation Department has partnered with the Lakeland Police Department to open a stand-alone facility for the Police Athletic League (PAL). On August 1st, 2015, the City of Lakeland and its community welcomed PAL into their new facility. The 3,511 square foot facility is located on 325 West 2nd Street and features a computer room, activity room, kitchen, athletic offices and a basketball court. The facility was the Ridge Community Center and it has been sitting vacant. The $110,000 cost to rehab the facility to meet the needs of the Police Athletic & Activities League was minimal when compared to the positive impacts it will have on our community. Lakeland PAL Early Football & Cheerleading Registration has started and we anticipate a great season. Lakeland PAL Hurricanes cheerleaders placed in every division at the Florida PAL Cheer Competition held in Daytona at Embry Riddle Aeronautical University. Our Cheerleaders, parents and volunteers help bring the Florida PAL Spirit Cup back to Lakeland as they filled the auditorium with chants and lots of hurricane spirit. The City of Lakeland Parks & Recreation is planning to build a multipurpose field that will be our new home for all little league sports such as football, baseball, soccer and fitness. Lakeland PAL participated in a fundraiser event at our New Restaurant Glory Days to raise funds for our trip to Washington DC. Glory Days agreed to donate 25% of their day earning to our PAL program. We advertised this event in our local newspaper, several radio stations, fliers, church announcements and encouraged our family and friends to come out and support. Glory Days raised $14,000 for the day and donated $3,500 of their earnings to our PAL program. Lakeland PAL after-school program strives to improve academic achievement, social competency, and social bonding within the youth of our community. We have 60 kids enrolled in our program. Thanks to our facility we are able to register We provide transportation, tutorial and computer lab assistance, while also offering a healthy snack and a full meal each week day. Lakeland PAL Youth Leadership Program year around program meet every Wednesday from 6pm - 8pm. We have 55 kids enrolled in this program. We are now able to feed our mentoring kids dinner on Wednesday night. Our youth participate in community service projects, trainings and special events. Lakeland PAL is making plans to travel to Washington DC this summer for an educational/ historical tour. We are raising funds so that we can provide scholarships to kids that come from low income families and cannot afford a trip of this magnitude. Each year PAL facilitate a summer program for teens and our goal is to help prepare these teens for college or the workforce. We take several colleges, historical and business tours to expose our kids to their future endeavors and possibilities. PAL Driven 1 Fitness program PAL hosted a 7 on 7 football event Saturday January 9th from 12:00noon - 4:00pm where over 100 kids participated in this event. The kids in our PAL Driven 1 program receive training on speed and agility, strength and conditioning, eye & ball coordination, physical fitness drills, quarterback, wide receiver and defensive back training. This program is for kids' ages 6yrs - 17yrs. PAL Wrestling is a year around sport where our practices are every Tuesday & Thursdays. We have around 20 kids enrolled in this program. 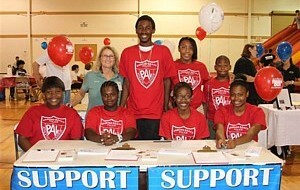 PAL Annual Fundraiser Event - PAL raised over $18,000 at our annual fundraiser event. Legendary Willie Horton was our guest speaker and this event was catered by Outback Steakhouse. We had over 500 guest in the house this year. Thanks in advance for your assistance and for helping us achieve our mission, which is, "Filling Playgrounds, not Prisons." Fall ball is currently underway. We currently have over 100 kids in the fall program. Our baseball season is scheduled to begin at the end of February. Last year we had over 250 kids in the program, this year we expect to have 300+. Participated in several tournaments throughout the U.S. We had one boxer that competed in the US Olympic Boxing Trials Qualifier event. We had 35 kids participate in the first session of Hockey is For Everyone Program. The intention is to get more minorities children involved in the sport of ice-hockey and from there to have several PAL teams. The FMPAL Rotary Cup Golf Tournament was held at the Fort Myers Country Club, over 100 golfers participated in the tournament. We raised over $36,000 for our PAL program from this tournament. The Lake Wales PAL has been actively engaged in numerous youth activities since our last report including the YDC, Youth Football, and now currently involved in youth basketball. We had one young man, Hamilton Johnson who participated in the annual YDC program. Hamilton is a sharp young man who carries a 4.2 grade point average, he is a natural leader, who is active with his church and its Young People's Division (YPD). He was a selected member of the E1T1 Elite youth AAU basketball program that has produced seven of the last nine Mr. Basketball, in the state of Florida. He has recently taken unofficial visits to Lehigh and Appalachian State University's during the month of November, as well as the University of South Florida with a planned trip to the University of Miami which was curtailed by a severe knee injury which occurred during a high school basketball game this past week. Please pray for him. Lake Wales PAL enjoyed another stellar season playing in the Florida PAL Elite youth football league for ages 4 - 15. We had several top teams in the league with our Sophomore and Senior teams being super competitive. Our Sophomore team only lost one official game during the regular season but was upset in the playoff's and didn't make it to the Super Bowl. Our Senior team bowed out in the 3rd round of the playoff's but represented their parents, town, and organization rendering great respect among the league. In 2014 we had a crowned champion, but in 2015 we were relegated to the stands of the stadium being spectators. On 14Nov15, we partnered with the Mt. Sinai A.M.E. Church Lakeland, Fl. in delivering over 66 Thanksgiving food boxes to elderly and special needs adults at their particular residences. These boxes contained everything from the turkey, to vegetable, and a variety of breads. Lake Wales PAL also partnered with Allen Temple A.M.E. Church in Lake Wales, Fl on 22Nov15, spearheaded by our own Gwen Hayes in serving 400 dinners to the seniors and needy and wanton of the community. We are scheduled to partner up and assist Mt. Sinai again on 19Dec15 with the dissemination of those boxes for Christmas dinner packages. The Lord continues to bless. Football season ended right before Thanksgiving, which propels our PAL on the last strides of registration for Youth Basketball. Registration has been ongoing since the beginning of October and continue through the 10th of December, with our official start date of league play beginning on 12 Dec 2015 running through 13 Feb 2016. On 05 Dec 2015, we had a hundred children in the Albert Kirkland gymnasium for drills, skills, and jamboree games. All the youth had a good time with many of them not wanting to leave the facility, that's what makes it priceless, and worth every effort put out by all volunteers for the promotion of our children.